Before the game I was on social media trying to get a feel for how the masses were taking in the warm-ups. But it turns out people were suffering from a hangover of dramatics from the Germany-France match which ended in penalty kicks. Needless to say, today was a great day for the women’s game. With Germany advancing by the skin of their teeth, people were hopeful for another great match between China and the United States. All-week long, media have been showing highlights of the 99′ World Cup Final where Brandi Chastain was forever etched in history after scoring the winning penalty kick and taking her kit off on-field. While China is the tournament’s youngest team, they faced a very strong, very seasoned U.S. side (who happens to be the tourney’s oldest team ). Many thought China would “park the bus” most of the game and sure enough, they did. Not the entire game, but most of the 1st Half. People have been dying to see the U.S. of yesteryear, stacking goals on top of goals. Dare I say USA fans have been “thirsty” for goals, and many thought with an opponent like China, that day had final come. 3 changes came to the starting lineup today. It seems the U.S. haven’t figured out a formula that works up top so until then, they’ll rotate and try new things. My only concern was not having a formula this late into the tournament. But luckily for the girls, they haven’t faced a top-10 opponent in a do-or-die situation just yet. But I digress, Amy Rodriguez got the nod to start her first game of the tournament up top alongside Alex Morgan. Also Morgan Brian started in a defensive midfield position, while Kelly O’Hara made her first start. I’m still not fully convinced on Amy Rodriguez but she did a fair job tonight. She pressured defenders and created chances but she didn’t come close to converting. Her speed is what troubled China tonight but they could’ve opted for Sydney Leroux for that. I am extremely proud of our back-line. Our Men’s National Team’s back-line could learn from the girls. Julie Johnston gets better every game while Sauerbrunn, Krieger, and Klingenberg all had solid performances. Abby Wambach was caught on camera giving the type of motivational speech you’d expect from her. But the part that stood out the most was “get a goal the first 10 minutes!” So once the 2nd Half started, in the 51′, Julie Johnston connected with Carli Lloyd who drove in a header to the low corner (right). Lloyd celebrated with the classic drop-kick of the corner flag (clutch) and the stadium erupted immediately. Naturally being an Atlanta publication, we were extremely happy to see 2 Georgians starting (Brian & O’Hara) but unfortunately, O’Hara’s debut was cut short after she was hit in the nose after attempting a header. China had 2 shots on goal the entire match so Hope Solo didn’t have to work too hard. With this 1-0 win the U.S. shutout streak has reached 423 minutes. Carli Lloyd scored the game-winning goal in her 200th career appearance. Solo earned her 134th career win, most of any U.S. goalkeeper. 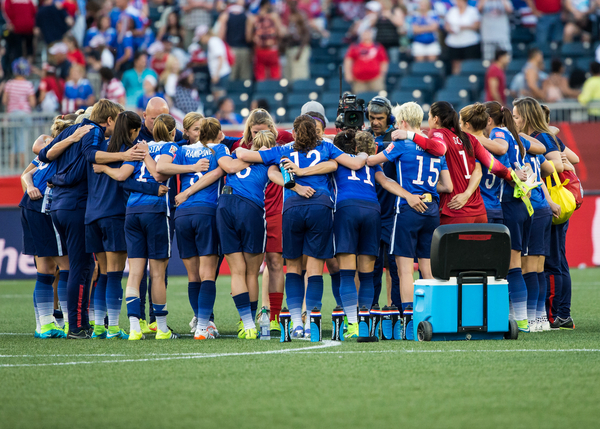 The U.S. will face Germany in the semifinals on Tuesday, June 30 at 7 p.m. ET at the Olympic Stadium in Montreal.